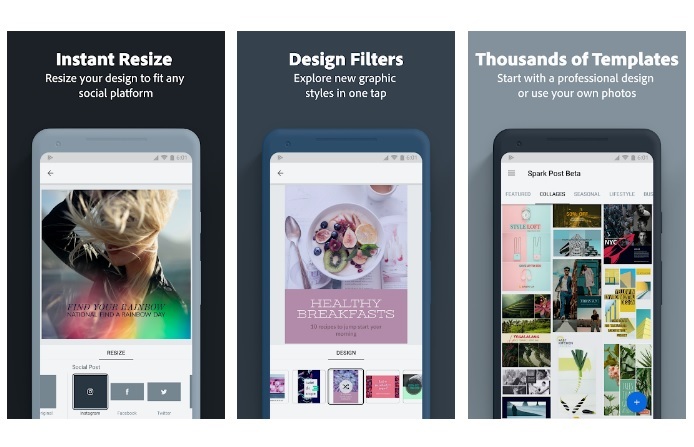 Adobe has finally released the Android version of Adobe Spark Post app. The Adobe Spark Post app is a graphic design suite released for web and iOS. It is the company’s storytelling app that includes ‘Page,’ ‘Post,’ and ‘Video.’ The app can create collages, flyers, and social posts based on a set of templates. After a huge demand from the public, Adobe finally made it for the Android platform. The Android version of the app gives you access to all of the filters, fonts, colors, shapes, and templates you’d find in the iOS version. Still, this is the beta version and users won’t get the full facilities and features which are in the iOS and Web. The UI of Spark Post app comes with Material Design guidelines, and features such as Magic Text and Auto-Resize. Adobe has planned to add animation/text effects, a hex color picker, Adobe Stock integration, custom size options, and much more in the future update. But those added features will comes with in-app purchase.